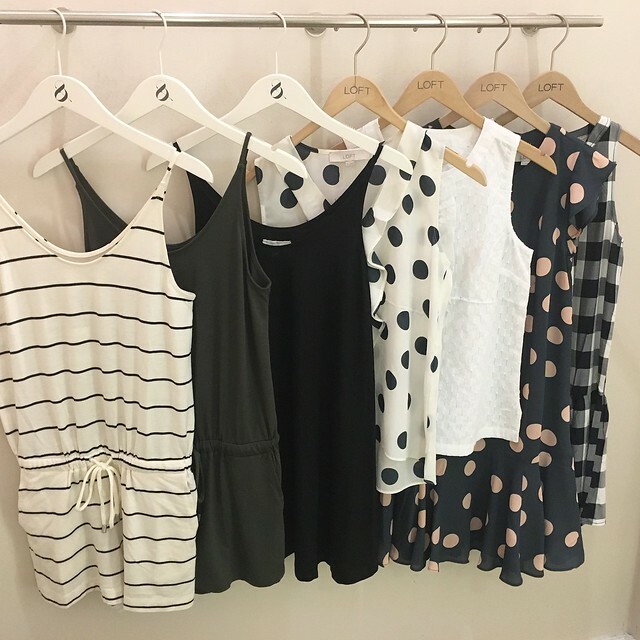 Get 40% off EVERYTHING at LOFT and that means that Lou & Grey is included too! Use code JUICY. Valid in stores and online. Cardmembers earn double reward points on your entire purchase June 23-26. I’m super excited about a lot of the pieces they most recently released for summer 2016. I ended up bringing home a couple of pieces with me so I could wear them right away. 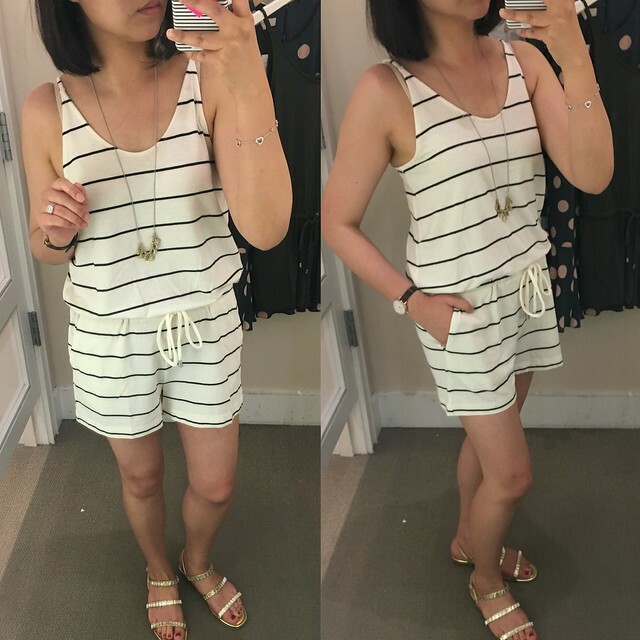 First up is this striped bare romper which I wanted after I saw it online. I was so happy to find this in my local store to try on. Surprisingly size XS regular fit me perfectly. I’d say this fits true to size but if you’re taller then you might find the straps which are not adjustable to be on the shorter side. This romper is very petite friendly and I would recommend trying on the regular missy sizes in store first the gauge the sizing if you’re on the fence about ordering it in petites. 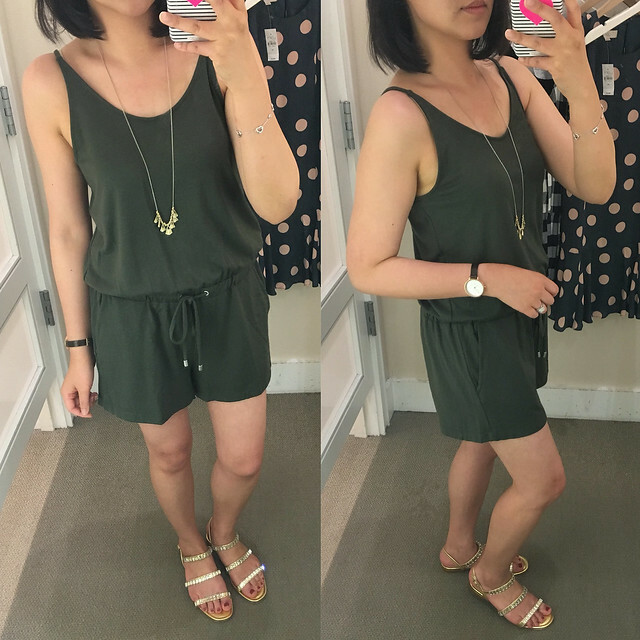 I loved the striped version so much that I also got the bare romper in the solid enchanted moss color. It’s so soft and the drape is very flattering. For my body type I usually dislike wearing anything belted because it accentuates how wide my waist is but this look comes across looking very cool and put together with a simple statement necklace and jeweled gold sandals. This bare swing dress drapes so well but it’s on the shorter side hitting a few inches above my knees. It’s such an easy dress to throw on over everything and the material is super soft. Similar to the above rompers I was able to take this dress in XS regular. If you’re taller then you may want to go up a size for a longer length due to the short hemline. For reference, I’m 5′ 2 1/2″ and you can refer to my measurements here. 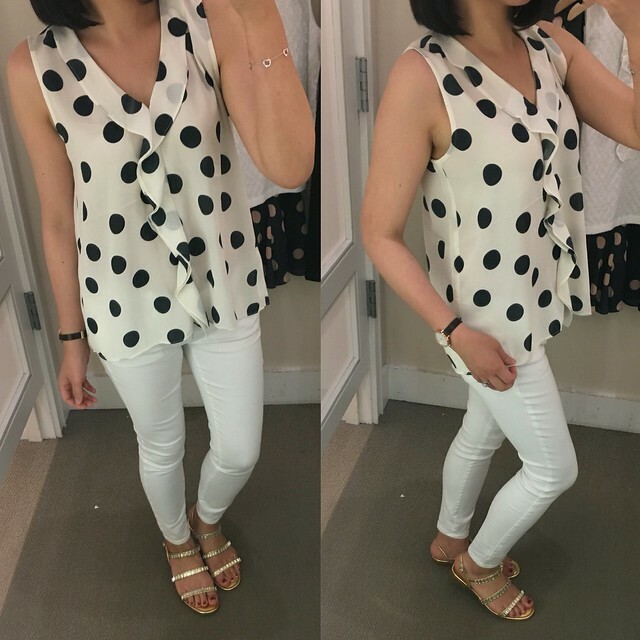 This dot cascade shell looked so cute online so it was another top I was pleased to see in store. Size XS regular seemed a bit short and the arm holes didn’t seem big so I tried it on in XS regular which fit me really well. I’d say this top runs true to size and I love the ruffles and large polka dots. It didn’t come home with me this time around since I was having some serious trouble deciding what to buy. 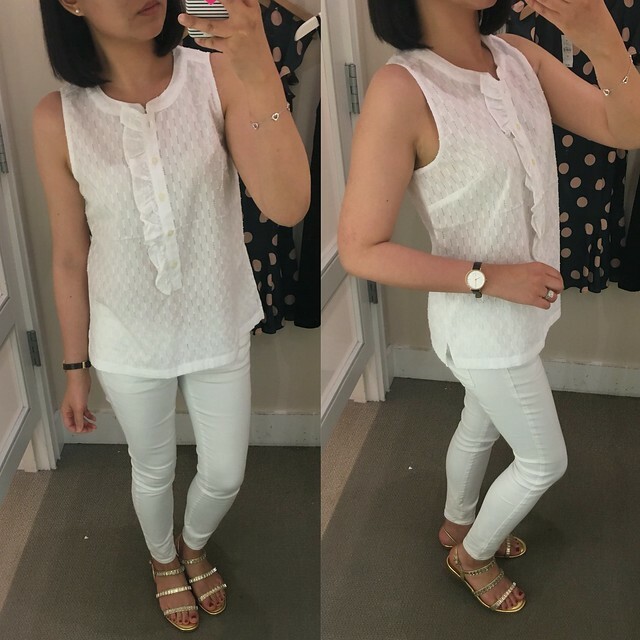 I loved so many of the items I tried on but I’ve been spending so much at LOFT and Ann Taylor recently. It can be difficult to narrow down what to buy now or purchase later at a better price since some of the more popular items tend to sell out more quickly. I thought this embroidered ruffle shell would be boxy on me since it didn’t look promising on the hanger but I tried it on and I really loved the fit of size XS regular on me. I’d say this top fits true to size. The material isn’t too thin and see through which is a plus. I adore the large ruffle as the focal point against the texture of this top. 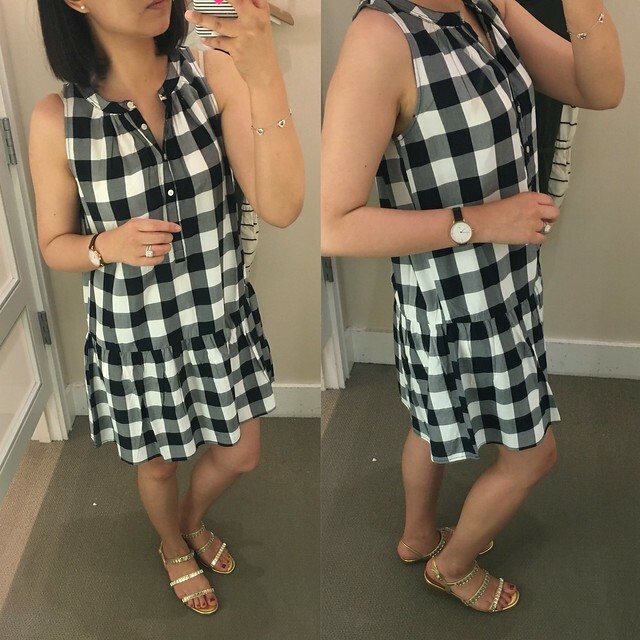 I tried on this gingham drop waist dress end of May but I didn’t get it then. I finally caved in yesterday and I got it so I can have one fun gingham dress in my closet. See size XXSP on me here. It fits exactly like the chambray drop waist dress that I reviewed in this post. It is a loose fit in my usual size XSP but size XXSP is a bit too short for my preference. I paired it with my denim jacket (review here, last seen here) as you can see here but the drop waist can be tricky finding the right layer to throw on over the dress. 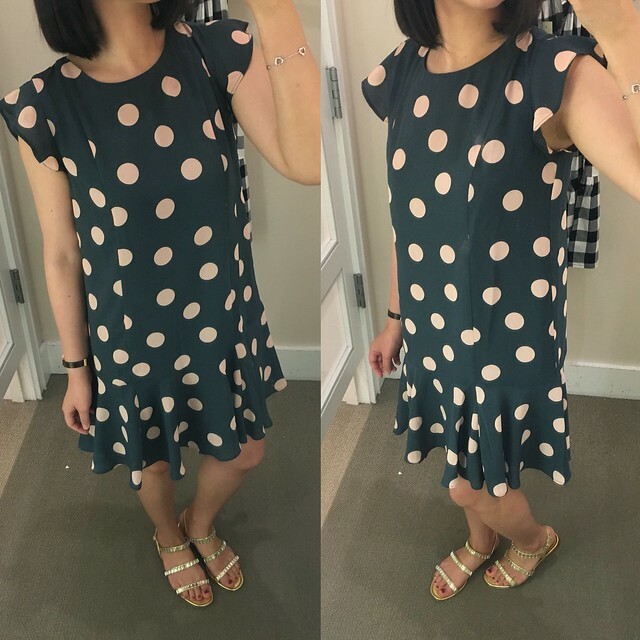 Lastly, I spotted this dot flounce dress with the pink polka dots so I figured I’d try it on just for fun. The regular missy length hits right above my knee caps and the arm holes are spot on in size XS regular. 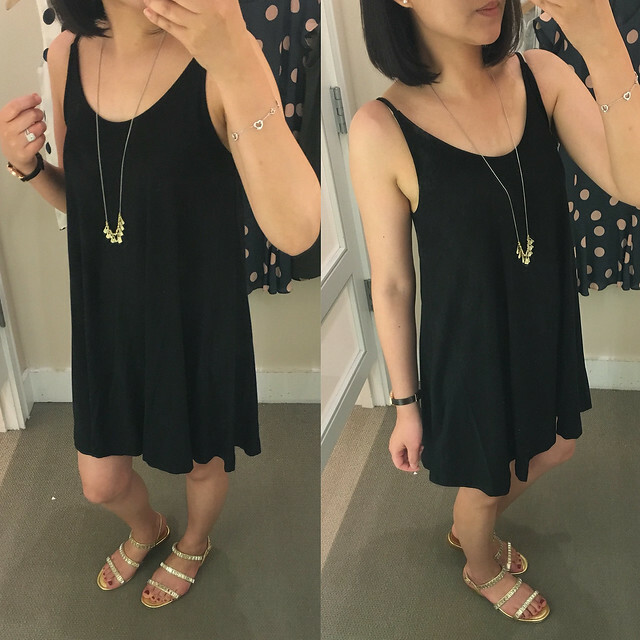 My local store at the Prudential Center also carried it in petites but I figured it would be too short on me so I didn’t try it on for comparison. See size XXSP on Annie. The cut of this dress is straight up and down with no stretch but it’s a looser fit. I didn’t like this dress on me since it makes me seem wider due to the shoulder ruffle detail. I also wish the skirt portion was more of a drapey/flowy a-line. The combination of the cut and print makes it seem more like a juniors dress.